Often overlooked, vertex painting is one of the simplest but useful tools Creators have available that can improve the appearance of their meshes with relative ease. In a nutshell vertex painting is the process by which colour (as red, green and blue [RGB] values) can be ‘painted’ directly onto the mesh, typically to tint, shade or otherwise augment the final appearance of the model, shading a creepers basement for example, or disguising the tops of massive tree-trunks as they disappear into a green fog. This looks totally safe… oh, no it doesn’t!. 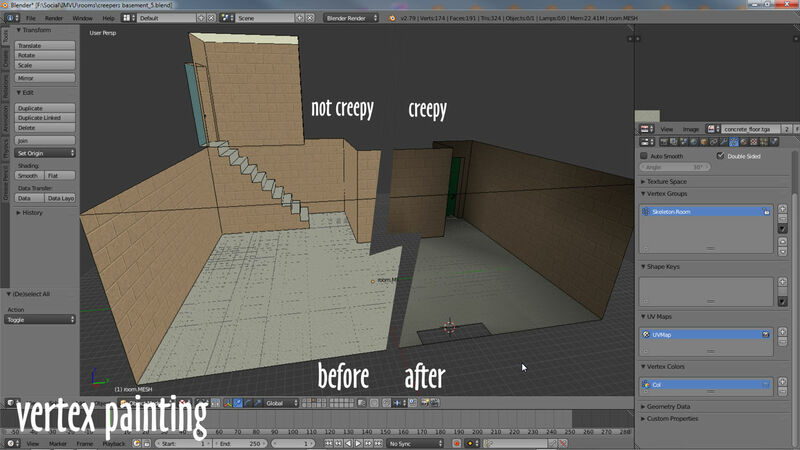 With judicial use of vertex painting and tiling textures a perfectly innocent scene can become not so innocent, a boiler-room turns into a don’t-go-down-there creepers basement. For IMVU vertex colours can be doubly useful as a means to decrease the resources consumed rendering scenes and their content (avatars included! ), and used well, can also be an effective way to reduce texture complexity or compensate for IMVU’s 512 x 256 asset limitations. IMVU limits image dimensions to 512 pixels in any one direction, anything over that is resized. Note also this means a 1024 x 1024 image will be resize to 256 x 256 NOT 512 x 512 as might be expected because 512 is only valid across one dimension, X or Y, not both. Is that Sweeny Todd’s?. Instead of shadows or shading being ‘baked’ (included) in an image mapped to an mesh and then stretching that to fit, which resulting in fuzzy or mushy images, a clean version can be applied and then augmented using vertex painting. 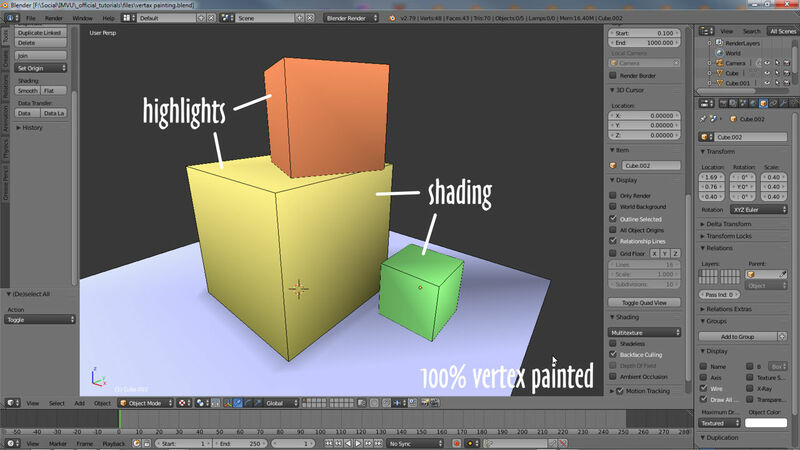 How does vertex painting work? What vertex painting is actually doing is using the vertex structure of the mesh as a very simple canvas, it does not paint surfaces so much as it adds colour to the underlying framework of vertexes that further describes edge and face sub-elements – vertex » edge » face – which allows for colour information to then influence those elements appropriately; paint a corner vertex blue and that colour will propagate outwards to tint related edges or faces, which in turn influence the spread, blend or fade of colour along those elements. 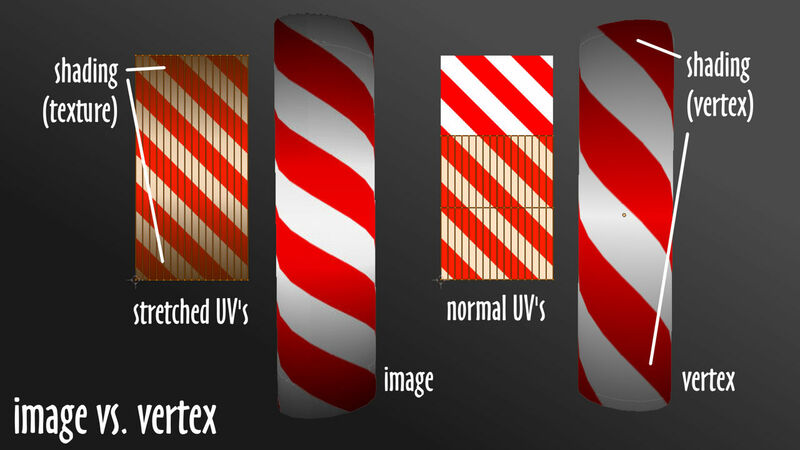 The key to using vertex painting is to include or add enough structure to accommodate vertex colour bleeding, blending or fading to white (typically the default colour value attributed to all vertices) or another secondary colour; for most meshes that simply need to be tinted a certain colour overall, they can be left as they are and relatively simple; for shading, giving the appearance of light and dark, this might not be the case with extra structure needing to be added. To use vertex painting a balance has to be struck between increasing the complexity of the mesh to allow colour bleed vs. meshes needing to remain low-poly and as optimal as possible for speedy processing and rendering. A simple scene in Blender coloured entirely using vertex painting – it can be used to ‘colour’ and ‘tint’ making some vertices/areas appear darkened although using the same underlying base colour e.g. yellow (wireframe overlay enabled for clarity). 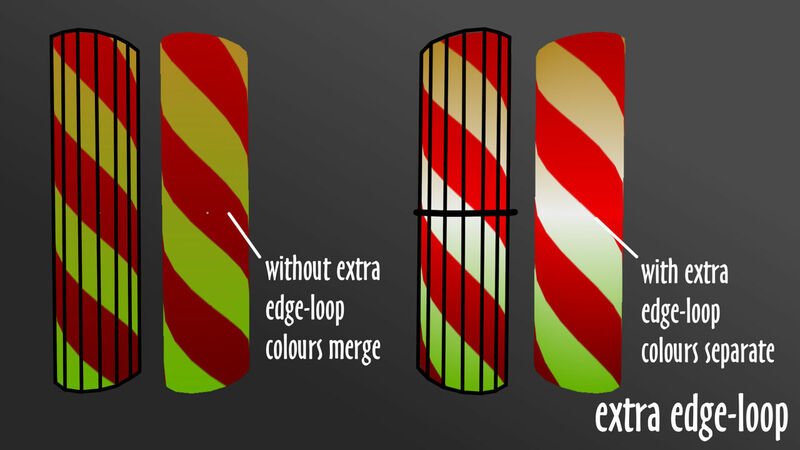 The barber poll above for example, left in its original state and painted, would result in the top and bottom colours blending together at the mid-point between the two. Inserting an additional edge-loop at this point now means both ends blending to white (default colour assigned to all vertices), preventing the entire object being more-or-less uniformly tinted. Being judicial with edge or vertex placement, this technique tends to yield more naturally authentic results more effectively and efficiently. For most relatively complex meshes additional structure does not need to be included to cater to vertex painting and colouring, if it does it’s ‘cheaper’ (uses less resources overall) to add then including larger, or more, textures. 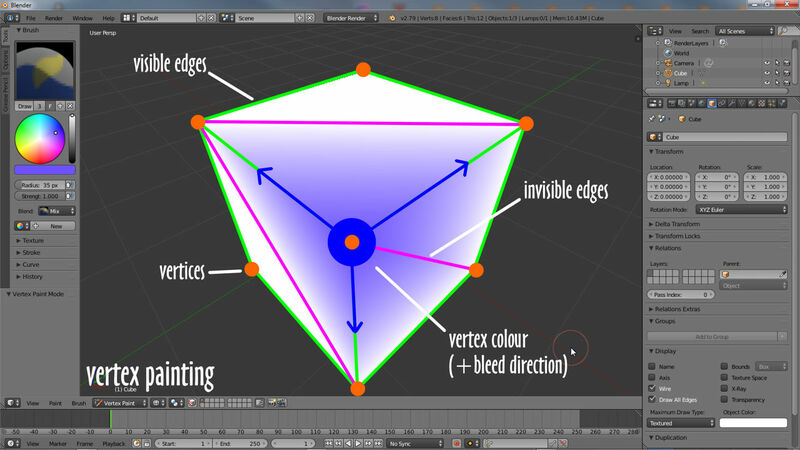 How vertex colour blends across surfaces is also determined by edges (linear structure) and faces (area structure). 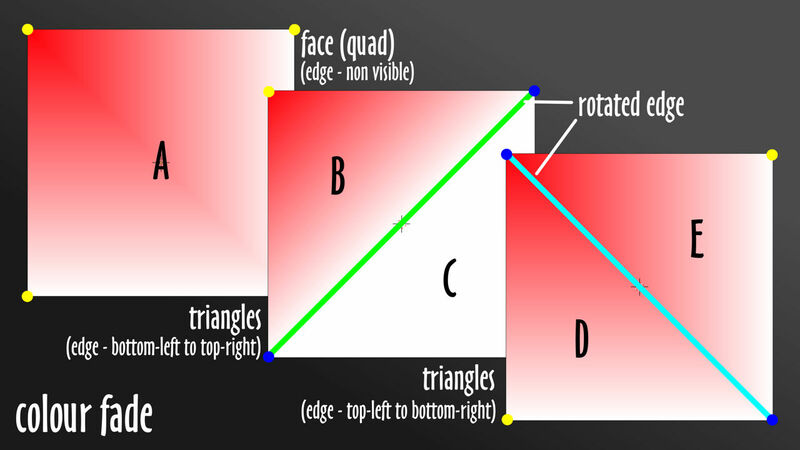 The latter, being polygons (‘faces‘ in Blender) are ‘quadratic’ – two triangles join along their respective diagonals to form a single surface bound by four edges and four corner vertices (A below, | |). In this state, even though the edge where the two triangles merge together is invisible, its inherent orientation still affects blending behaviour, which travels along the (invisible) edge. Shown below for example, colour painted top-left with a bottom-left to top-right edge orientation (| / |), restricts colour fading to the top-left (B/C below). Aligning this edge with the painted vertex (top-left to bottom-right, | \ |) lets the colour blend along its entire length giving the appearance of a stronger transition covering a larger surface area (D\E below). With careful use, a simple edge rotation can reduce the need to include extra structure. Bleeding Edge! The structure of the mesh determines how colours bleed or fade out so some reorganization may be necessary for best results – use Ctrl+T to split selected faces into triangles.